Don’t worry, it’s old enough to order a drink. Delivery robots are starting to hit the streets, but few do it with as much joie de vivre as a new device called the Fundroid. 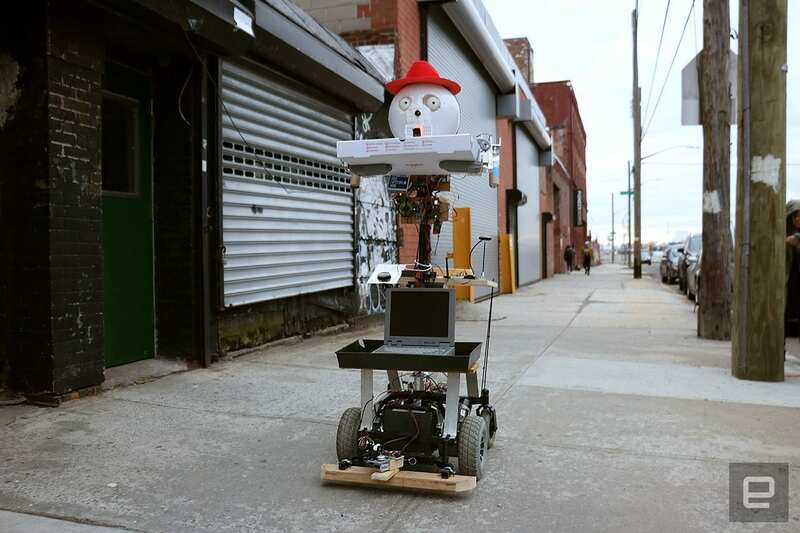 The gender-neutral beer-and-pizza-fetching robot, lovingly nicknamed Funnie, debuted at the Software For Artists event Sunday in Brooklyn, New York. Funnie made its way to a nearby pizza store and bodega to order, pay for and deliver food and beverages to the guests at nonprofit foundation Pioneer Works, which hosted the event. The Fundroid is different from other delivery bots in several ways. Not only is Funnie the first humanoid transportation robot we've seen, but it's also able to order and pay for food instead of simply picking up and delivering a paid-for meal. There aren't any plans to make Funnie a publicly available system, though, so those hoping to get their very own bot to serve them beer and pizza shouldn't get too excited. 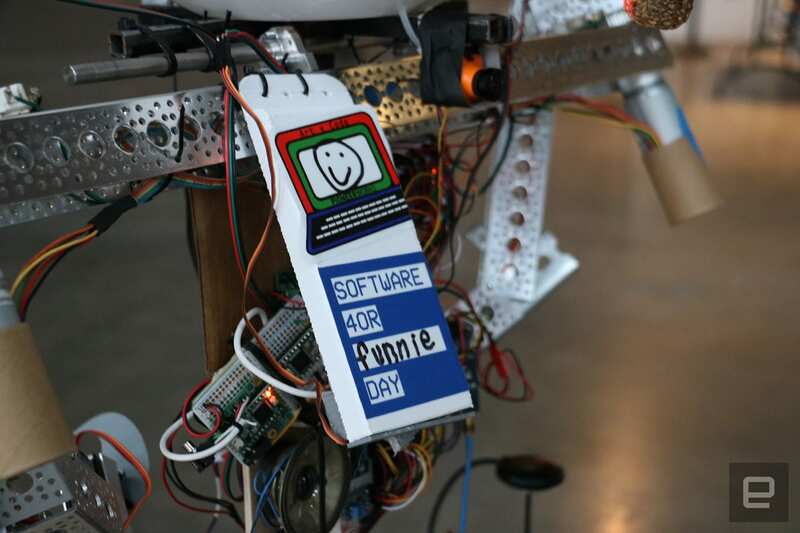 David Sheinkopf, director of technology at Pioneer Works, and his team came up with Funnie as a way to demonstrate that robotics can be entertaining, approachable and artistic. It's clear the second you lay eyes on Funnie that it's not your typical bot. Funnie looks more like a sculpture that was cobbled together from various junkyard parts. The version I saw had exposed wires and motors, as well as add-ons that seemed haphazardly glued on. 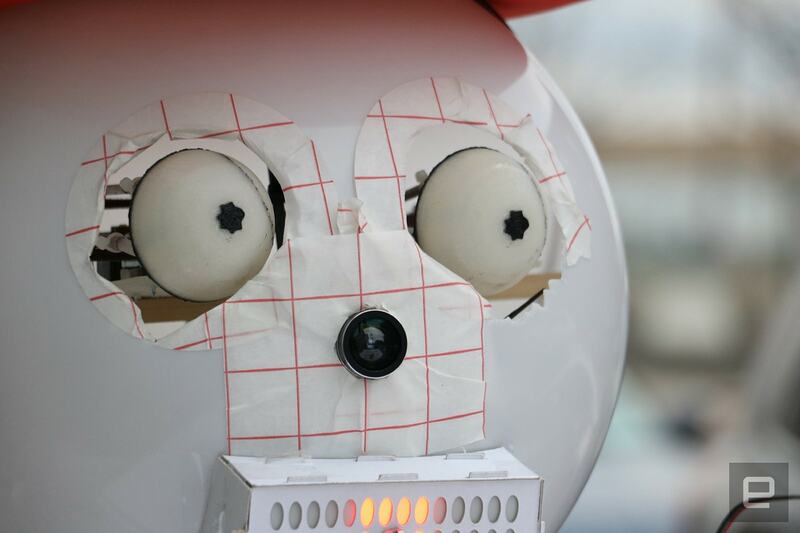 In fact, the part of the robot that looks the most finished is its head, which is made out of a lampshade with holes cut out to house its 3D-printed "eyes." Between these sits the webcam that serves as Funnie's nose. This scans the surroundings for QR code-like graphics on the doors of participating stores. From the geometry and shape of these symbols, Funnie can calculate its angle from the front of the door and position itself so it's directly facing the store's entrance. The Fundroid can't climb stairs yet, so it needs help getting into places that have a step at their door and don't have a ramp. But the establishments that were expecting Funnie on Sunday had already been warned of this, and were ready to assist the robot when it arrives. That's one of Funnie's limitations: It's not completely autonomous. Rather, it requires the people it interacts with to keep pushing a big button that says "Proceed" to trigger its next action, such as greeting its audience or rattling off an order. It would be easy to make Funnie more intelligent -- say, by adding a weight sensor on its arms to tell when food has been placed on them, or facial recognition to detect when someone is standing in front of it. Nonetheless, for a robot that was put together in just eight weeks, Funnie is impressive. It gets the job done. Once Funnie is inside a store, it will (after someone pushes the Proceed button) order pizza or beer. It does so in an endearingly old-fashioned way, asking the "kind proprietors" for some "pizza pie." Indeed, Funnie's language is a big part of its charm. Cheesy lines like, "My, my, my, I love a pizza pie" are at once amusing and endearing. Just like its exterior, Funnie's vernacular seems slightly archaic. Speaking of, one of the oldest parts of the robot is its chunky elephant of a laptop that runs Windows 95. When I asked Sheinkopf why the team used such an outdated system, he deadpanned, "Because it needs to buy beer." Get it? As of 2017, Windows 95 is a 22-year-old operating system and can legally buy alcohol in America. Also unique to Funnie is its "money-dispensing unit," an envelope-size box with a motorized cover that opens after the robot orders its food. It's a rudimentary setup, but when Funnie says "keep the change" and snaps the money box shut, you can't help but smile. Once Funnie receives the pizza, it uses sharp, hook-shape "thumbs" (that Pioneer Works calls its talons) to punch holes into the box. This keeps its precious cargo from slipping out of its grip as it navigates the bumpy streets on its way back to the event. Traveling at about 3 to 5 miles per hour, Funnie is not at risk of violating any speed limits. And with the cold January weather, it's safe to say the pizzas were no longer hot when the robot returned to the event. A lot of the tech that powers Funnie is basic but effective. It has motorized wheels, a LIDAR object-detection system to help it recognize walls and run parallel to them, as well as onboard GPS. But GPS can be inaccurate or unreliable for the short routes that Funnie travels. Sheinkopf and his team worked with Brooklyn-based Smooth Technology to use an odometer and a mathematical algorithm to track the robot's distance traveled by counting how many times the wheel has made a complete revolution. One thing that's important to note about Funnie is that it's not intended to be anything more than a mere tech demonstration -- not to mention a means of entertaining guests at Sunday's event. If Funnie were really to take to the streets of New York, it would not survive. Its slow traveling speed and reliance on outside help, among other drawbacks, make it less useful in real-world scenarios. But that doesn't mean the robot doesn't serve a purpose. Sheinkopf sees Funnie as something that technologists and artists can gather around at Software For Artists, showing folks from both fields that tech can be expressive and personable. The gathering aims to bring together the two realms and foster collaboration and crossover in more meaningful ways. After the demonstration, Sheinkopf said that his team will be repurposing Funnie's position-tracking components for other projects. So even though it won't be making any deliveries after Sunday, Funnie will live on in other, potentially more useful, ways.